Chicago Bears Offseason 2017: What Does the Offense Need? Improving the Chicago Bears offense starts with addressing these key positions in the upcoming offseason. Let’s just state the obvious: The Chicago Bears did not have a good offense in the 2016 season. Starting three different quarterbacks is never going to help, but the Bears ranked 15th in yards per game yet only 28th in points per game. Former offensive coordinator Adam Gase—who left last year to be the head coach of the Miami Dolphins—was missed. And his replacement, Dowell Loggains, appeared to be over his head at times. Perhaps the biggest problem the Bears had on offense was lack of talent. The good news is that the team has an arsenal of draft picks and money to spend this offseason to remedy that. In theory, every position would see an uptick in production next season, but there are four positons that need to be addressed right off the bat. This is priority No. 1. In the NFL, teams don’t win without a stud quarterback. Just take a look at the four teams in this year’s Conference Championship games. All four teams had Pro Bowl, franchise quarterbacks at the helm. Jay Cutler will probably be gone, and no, the long term answer is not Brian Hoyer or Matt Barkley. Whether the Bears trade for a quarterback (i.e. Jimmy Garoppolo) or use a high draft pick on one, the talent at this position needs to be drastically upgraded. It’s yet to be seen if general manager Ryan Pace knows what he’s doing when it comes to evaluating quarterbacks (he’s never drafted one in his two-year tenure), but fans should give him the benefit of the doubt. It’s the biggest player decision Pace has had to make, and his choice could very well determine his long-term fate in Chicago. Incumbents Charles Leno, Jr. and Bobby Massie aren’t going to be mistaken for Pro Bowlers any time soon. Leno had a so-so year at left tackle, and Massie had his share of positive moments in 2016. However, both positions could use an upgrade. Protecting the new (hopeful) franchise quarterback is a must, and while the interior of the line appears set, competition at both tackle spots cannot hurt. The Bears did themselves a favor when they traded Martellus Bennett in the offseason last year. While talented, Bennett started to become a headache in the locker room, and his attitude was not a good influence on the younger players. The Bears should have addressed the tight end position last season, but didn’t. It was just a matter of time before Zach Miller got hurt again, and sure enough, Miller broke his foot against the New York Giants in Week 11. After he went down, the Bears hardly got any production from the position. Miller surely will be back in the mix, but with his lengthy injury history, guaranteeing he plays in all 16 games is nearly impossible to do. The Bears have some projects currently on the roster (Daniel Brown and Ben Braunecker), but it would behoove to team to sign a proven veteran to compete with Miller for the starting job, or at the very least, provide solid depth. Regardless if the Bears decide to resign Alshon Jeffery or not, the wide receiver position is certainly one that needs to be addressed. The Bears have a lot of cap space, so franchising Jeffery might be the best bet. However, even if he’s back, who is going to play opposite of him? Kevin White has a tremendous amount of talent, but he just can’t stay on the field. In his two seasons in the NFL, White has only played in four games. 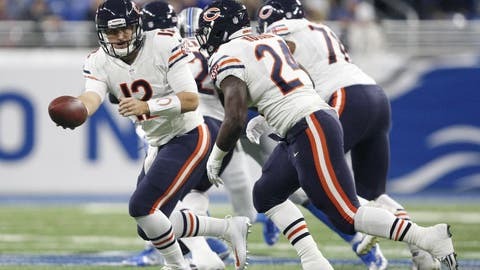 Worse yet, when he was out there, he looked slow and unsure of himself, and I don’t know if the Bears can count on him being a starter moving forward. Eddie Royal was signed by this staff two years ago to be a reliable option in the slot. Much like White, however, he cannot stay healthy. His time in Chicago appears to be done. Marquess Wilson can’t stay healthy either and, while Cam Meredith showed flashes late last season, the big question is can he repeat that performance or not? The Bears lack speed at the position, so bringing in a receiver who can take the top off a defense is a must. After that, it’s all about just signing or drafting talented guys who can help the next quarterback succeed in Chicago. The Bears need a lot of help on offense, and let’s see what Ryan Pace and John Fox have up their sleeves. The ball’s in the their court; now let’s see what they do with it.